Acting powerhouses Tom Key and Kenny Leon reprise their acclaimed 1998 roles as half-brothers, one white, the other black, in 1960s South Africa in this searing masterpiece about the corrosive effects of Apartheid and the inextricable familial ties that bind. Recommended for ages 12 and up, for adult themes and language. 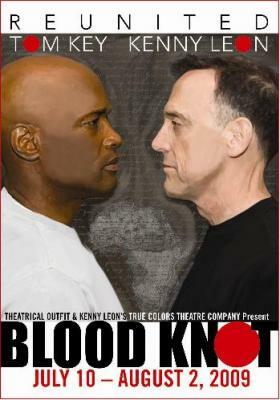 This is a co-production with Kenny Leon's True Colors Theatre Company and is directed by Susan Booth. The black man has lived there �for as long as I remember.� The white man moved in last year and manages the house and the money while the black man keeps the house running with the sweat of his labor. They claim to have the same mother, but different fathers. The white man has created a household bound by rigid rules, rigid codes, strict schedules, looking to the future. The black man just wants his life back, to work and live and laugh and drink and love. Both men are poor. But when the racial equation dons the clothing of a class equation, race becomes less relevant than power and scorn and violent hatreds. This sketchy outline describes not only the history of South Africa, but also the allegorical play Athol Fugard wrote about it early in his career, when the country was still under the ironclad laws that comprised Apartheid. It is given a skillful and affecting reading in a joint True Colors / Theatrical Outfit production, starring the artistic directors of the two companies (Kenny Leon and Tom Key) and directed by the Alliance�s Susan Booth. Normally, such an intellectual exercise would be a play-goer�s burden, a piece we are �required to respect and appreciate,� even if we do not actually enjoy it. Indeed, the young Mr. Fugard created two characters who are more symbol than person, devised actions that inform his metaphor more than tell a compelling story. Even the script's strengths, the profound language, the imaginative role-playing, the quirky characters � even these owe more to Mr. Fugard�s apparent characterization of the two competing races/classes than to anyone recognizable or theatrically unique. And even the climactic scene with its sudden violence seems more calculated to evoke cultural outrage than emotional empathy with the characters. Yet, I found myself spellbound by the story, even with my own post-Apartheid cultural smugness. Mr. Key and Mr. Leon here give two of the best performances you are likely to see this year. They have the truly remarkable ability to get beneath the intellectual sketchiness of the symbols, and to find (or create) the beating heart of human beings. When the script forces them into contrived situations, they make me see how the �dots are connected,� how the actions and choices they make come naturally. As we enter the theater, we are confronted with a shantytown cardboard and corrugated metal shack. Mr. Key is already on stage, waiting, doing nothing other than stealing the occasional glance at an oversized alarm clock. Most of the audience is hushed, expectant, not knowing if idle pre-show chatter would disturb this man�s patience (I hate to say calm, because, still as he is, his eyes are wide, moving quickly, almost paranoid). The alarm clock goes off, the house lights dim, and we dive directly into the play, with no 4th-wall-breaking curtain speech or �turn off your gadgets� advisory. Mr. Key (�Morris�) springs into action, preparing the house for the arrival of his half-brother �Zachariah� (Mr. Leon). With only these two characters to guide us, we are on our way. Morris convinces Zachariah to become a pen pal to a lonely-hearts-ad woman. The woman writes back, and eventually wants to visit. Zachariah convinces Morris to pretend to be him, using their (or, more accurately, his) savings to buy a �courting suit.� Once Morris is dressed like a wealthy South Afrikaner, the derision, the hatred, the violence come out, as if Apartheid were nothing more than a class-oriented suit that would disappear if the wearer chose to return to his rags. I have to confess that I enjoyed the banter between the brothers, the imaginative role-playing, the Cyrano �I�ll write for you� allusions. I enjoyed the set (by Leslie Taylor), which forced the two into a small playing area while suggesting the vastness of the shantytown that surrounded them. I even enjoyed making the allegorical connections, seeing Morris and Zachariah as representative of the country as whole, particularly the ways Morris �controlled� the situation, forcing Zachariah into situations and choices that would never have been his own without the intrusion of his brother. All this being said, the play, as a whole, left me feeling a bit, well, mind-f*$%ed, without being emotionally satisfied. It didn�t really get to me at a gut level, the way that so many of the other plays I�ve seen recently have done (or, for that matter, the way that Mr. Fugard�s later work could, such as �Master Harold and the Boys,� �Valley Song,� �A Lesson From Aloes� or �Statements�). It may be that Mr. Fugard was more interested in telling his country�s story, and that particular story has already had its next chapter written and reviewed. It may be that he was more interested in using his characters as political tools, than in creating dimensional people with a compelling story. It may be that my own preferences are more for characters who deviate from the norm rather than represent it. I daresay, without the talents of Mr. Leon and Mr. Key, without the compelling vision of Ms. Booth and her design team, this would have come across as a sterile classroom exercise in a history that is no longer relevant. I�ll even go out on a limb and say that simply reading the script would leave that impression. But, given a production of this caliber, performances of this quality, sterile history comes alive in a compelling series of games and cruelties and imaginative leaps. It feels somehow petty and selfish, but I honestly wanted more out of this production. And I truly envy the many many others who are finding it.